Do you demand an over-the-air DVR with a rich program guide, automated series-based recordings, a silky-smooth interface, and whole-home streaming features? If not, the Mediasonic Homeworx HW180STB might be the DVR for you. This $35 box—billed primarily as an analog-to-digital converter—has none of the sophisticated features you’d find in other solutions, such as the Tablo and TiVo Roamio OTA. The menu system is clunky and often confusing, there’s no easy way to resolve scheduling conflicts, and even some common tasks like weekday-only repeat recordings are a chore. But at $35 with no subscription fees, it is among the cheapest solutions you’ll find for recording free broadcast TV channels. And because the Mediasonic Homeworx HW180STB stores its recordings to external hard drives in a format that Windows recognizes, PC owners can grab their recordings to watch on-the-go. Just be prepared to wince through every part of the process. 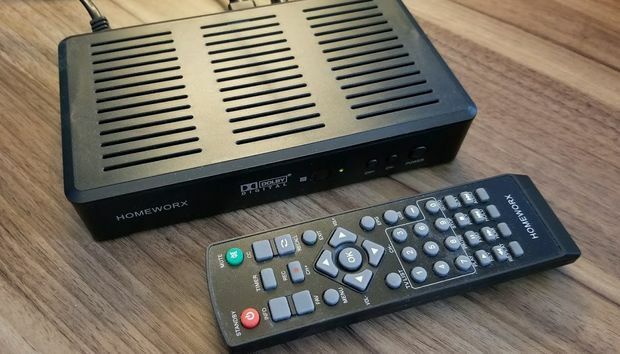 The Homeworx is larger than most streaming TV boxes, but smaller than a TiVo or a typical cable box. Plug any antenna into it, then plug it into a television via HDMI or composite video output, and you can start watching live broadcast channels. Connecting an external USB hard drive enables the recording functions. The Homeworx has HDMI and composite outputs for both your newest and oldest TVs. An included infrared remote control requires line-of-sight to the box, and is loaded with buttons for things like the channel list, programming guide, channel recall, and playback controls. Yet it can’t learn any TV controls such as volume or power, so you’ll still need to keep a second remote handy. 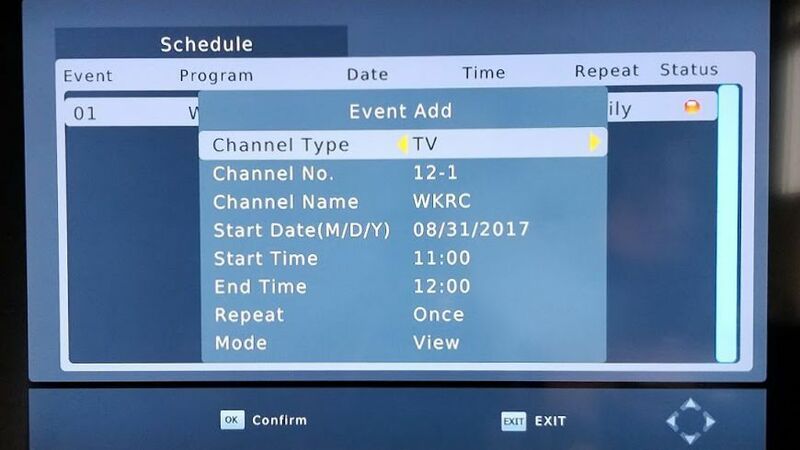 The Homeworx uses over-the-air data to power its crude channel guide. From the guide, you can select any program for recording, bringing up a menu for tweaking start and end times, and setting up daily or weekly repeat recordings. You can also open a separate menu to create new recordings manually. There’s no easy way to set weekday-only recordings for news and talk shows, though, so the only workaround is to schedule five separate weekly recordings for each day. Otherwise, you might run into scheduling conflicts with weekend programming. Speaking of which, the Homeworx offers no conflict-management features whatsoever, so you’re on your own to keep track of overlapping recording sessions. 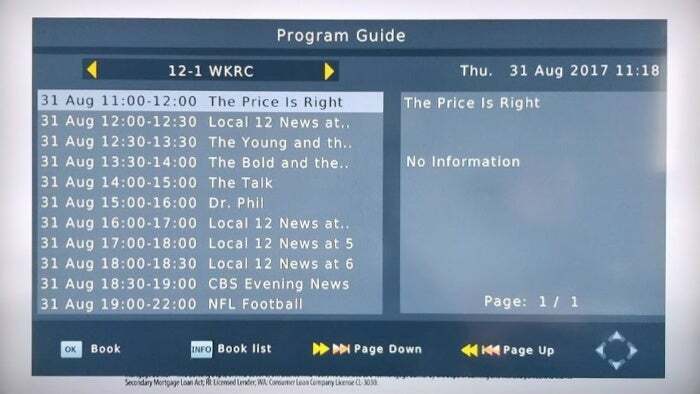 Recording options are limited on the Homeworx DVR. Time-shifting for live TV is similarly clunky, but functional. Pressing pause or the record button on the remote enters time-shift mode, which takes about 10 seconds to initialize. The device doesn’t record video for time-shifting automatically, so unless you remember to set it up, you can’t rewind to watch something you missed. You also can’t access the program guide or channel list while time-shifting or recording is in progress. When it’s time to actually watch your recordings, you must jump through several menu layers to the “PVR” section of the “Multimedia” menu. From here you can cycle through an alphabetical list of programs, with file names based on the channel and date of the recording. Sorting by show isn’t possible unless you rename each recording—a painstaking process given the sluggishness of the device and the mushiness of the remote. Don’t expect much in the way of softing options for your recordings. The one feature of Mediasonic’s Homeworx HW180STB that qualifies as advanced is the ability to pull out the hard drive, connect it to a computer, and grab the video files that are saved in .MTS format. 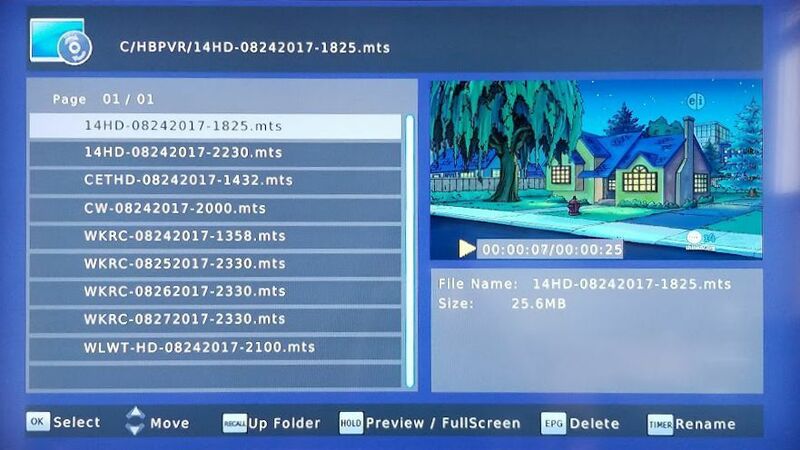 Both Windows Media Player and Windows 10’s Movies & TV player support this format, so you can take the files with you on any laptop. You can also transfer the files to any mobile app that plays .MTS files, such as VLC for iOS and Android. More elegant tools do exist for accessing DVR recordings on multiple devices, such as Tablo’s networked DVR, and media server-based DVR products such Plex and Emby. Still, all of those solutions require at least $200 worth of hardware to record and serve up the video, while Plex and Emby require subscriptions for even the most basic DVR features. By virtue of being so much cheaper than other solutions, the Mediasonic Homeworx HW180STB has something unique to offer. But it also has a frustratingly high number of self-inflicted wounds. At times, it feels like operating a VCR box from the 1980s, only with a hard drive instead of tapes to store the recordings. 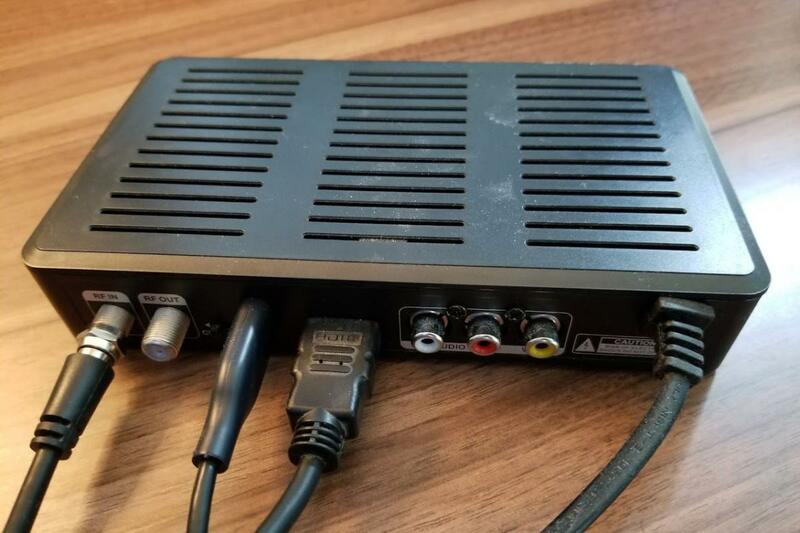 It’s nice to know that such a low-cost DVR solution exists for cord-cutters. Just don’t say you haven’t been warned about this one's shortcomings.